Looking for the best mole repellent and deterrent in 2019? What mole repellents actually are? How repellents work and if there are any risks? 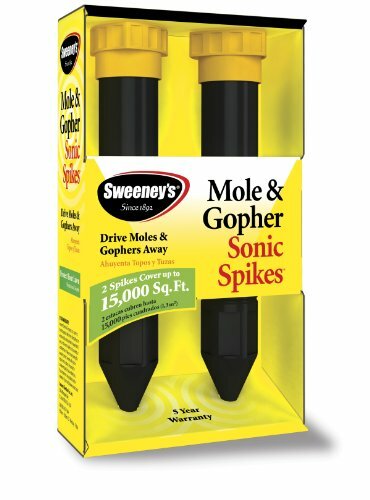 Out of the mole repellents and deterrents we reviewed, our favorite is the Sweeney Sonic Spikes for moles. Because it doesn't use any chemical ingredients, it's solar powered (no batteries! ), water proof, and has accumulated dozens of positive user experiences. The unit comes packaged as stakes that can be planted around your yard. They release vibrations (pulses) into the ground which distract and disrupt moles making the area undesirable forcing them to leave and/or relocate their tunnel system. As an an alternative to ground stakes, we did also like Sweeney's Mole Repellent formulation. It's made with castor oil, which is a popular mole repellent that has been successful. They come as small granules you spread around your yard. Although both methods CAN work, repellents and deterrents are temporary measures that will only deter your mole and/or possible relocate them to a neighboring yard. For a more permanent solution, we recommend opting for a good mole trap or effective poison treatment to ensure your yard is mole free. If you're interested in learning more about mole repellents or want to read more about the other products we considered, see below! Want to skip all this research and just hire a decent exterminator for your mole problem? What Is a Mole Repellent? How to Use a Mole Repellent? How Much Do Mole Repellent Cost? A mole repellent is any product or device designed to deter moles from entering a specific area. Most repellents are either chemicals, granules, or stakes that emit irritating sounds or vibrations. Moles are small, burrowing mammals that eat insects and create elaborate underground tunnels for their homes. Repellents protect gardens by emitting annoying sounds, vibrations, or odors that attack a mole's delicate senses. For example, castor and garlic oil are popular ingredients in most products because of their strong smell and ability to make the eyes burn and water. Some people also like to use mothballs to help with mole removal. Moles are extremely sensitive to smell and movement, which scares them off after you treat your yard. Most repellents come down to using either chemicals or pulse vibrations. "Chemicals" does not always mean poisons. Instead, it is a general term used to describe non-mechanical pest control options like granules that use castor oil as the main active ingredient. Chemical based repellents that use castor oil target a mole's sense of smell to discourage mole activity. The vibrating stakes are more to annoy moles forcing them to build their tunnel systems in a different area. Both methods can work, but your results will likely vary depending on the type of mole you have and its temprament (e.g., some moles might not care about the smell of castor oil or vibrations). What Are the Risks of Repellents? All of the mole repellents on this list have little to no risks since they don't involve poisons or environmentally unfriendly ingredients. Still, none of the products should be ingested and the user should follow all of the instructions carefully. 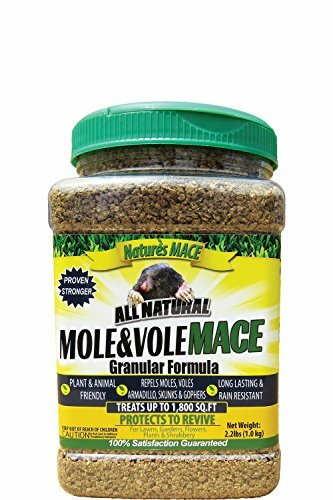 The best way to use a mole repellent is to spread the stakes or granules around the yard and keep them near the holes into their tunnels. This way, the moles can't avoid the repellent and can't escape it. If you opt for vibrating stakes, we recommend getting a unit that is water resistant and charged via sunlight. Most are not completely waterproof so you'll need to keep watch if you get a large rainfall that will create standing water or puddles. Most units radiate about 40-50 ft in all directions. For best results, make sure to spread the each unit about 90-95 ft from one another to ensure the greatest amount of coverage around your yard. The last bit we'll mention is that vibrating stakes do not work that well in soil that is loose such as dry sand or peat soil. Once you place the stakes, it generally takes 1-2 weeks to see any change in mole related activity. And that's it. Nothing too complicated. If you want to expand your coverage, you'll just need to buy more stakes. Mole repelling granules are bit different. A quick and dirty method of application is that you spread them around your yard by just opening up the top of your bag. It's not ideal, but it could work. We recommend grabbing a rotary broadcast spreader to evenly distribute the granules around your yard. In general the price varies based on how technologically advanced you want to get but you're looking at $20 for a low end product to something closer to $80 for a more robust approach with granules and vibrating stakes. Mole repellents are some of the most effective pest control methods available since moles have powerful senses and don't like things that smell or taste bad. However, it's important to remember that different materials work best for different creatures, so you can't expect a single repellent to affect all animals the same. Overall, repellents will do just that, repel. Assuming you spread castor oil granules around your yard you'll probably end up forcing the moles to your neighbors yard, which technically solves your problem, but not really. Redeo produces solar mole repellent stakes which vibrate and emit low-frequency sonic pulses designed to disrupt the ground and disturb moles. The stakes are made from environmentally friendly materials, use no chemicals, and feature rechargeable solar batteries. The pulses are harmless to humans, pets, and other animals. Redeo stakes are weather resistant, durable, and made from anti-corrosive materials. The repellent works against moles, gophers, voles, and other rodents. I recommend this product to people willing to spend some extra money for environmentally friendly protection against moles and have smaller yards. 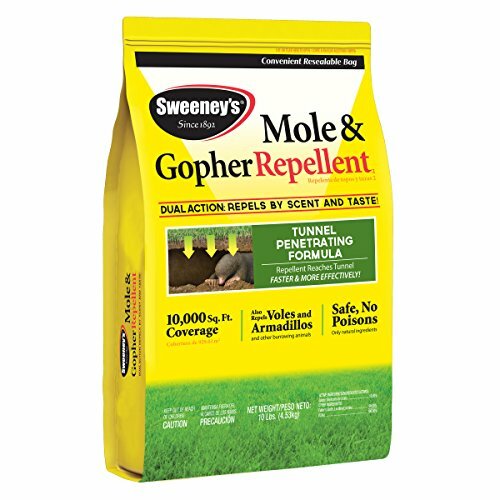 Sweeney's Mole and Gopher Repellent comes as an easy to use 10 lb. pack of granules. These granules should cover yards of most sizes and works against moles and many other burrowing critters. The granules repel using a mole's senses of scent and taste, making the ground unpleasant to be around. It also leeches into a mole's food source, making it seem tainted and encouraging the moles to move elsewhere. Sweeney's Mole and Gopher Repellent is the most "regular" of the repellents in this list and is what most people expect. We recommend this product to people who are weary about using sonic repellents and would like something simple to use. One bag can cover roughly 5,000 to 10,000 sq. 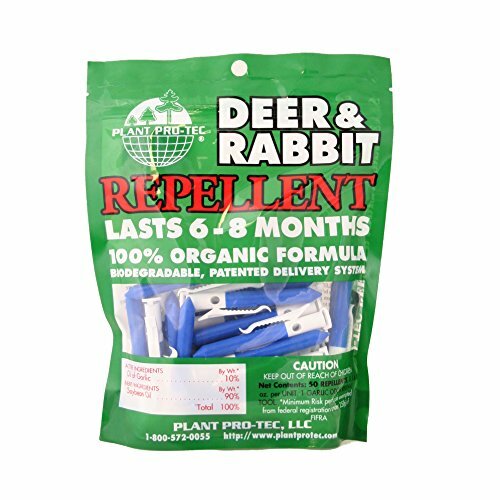 ft.
Luster Leaf Fend Off is a mole repellent that comes in biodegradable plastic tubes. It uses natural garlic oil to create a repulsive environment for moles and drive them away from gardens. The repellent will not harm human or animals and usually can't be smelled by the user. It will not drive away beneficial creatures like worms. We recommend Luster Leaf to individuals who need a reliable mole repellent on a budget. 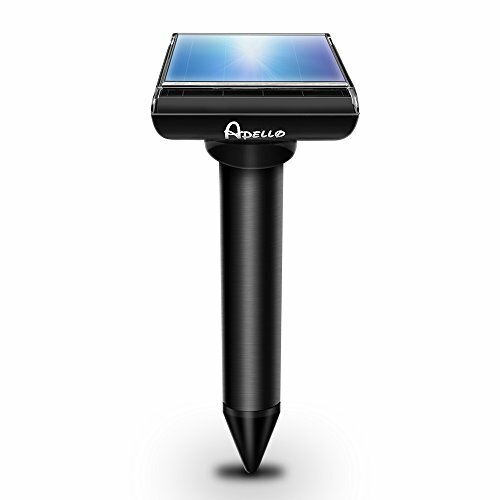 The Apello Mole Repeller is another solar-powered repellent designed to send sonic pulses and vibrations into the ground. Users can place the stakes all around the yard for maximum effectiveness. Each one comes with a rechargeable solar cell so buyers don't need to invest in batters or any other outside energy source. The main difference we saw between these units and the Sparkpod stakes above was that these had a bit less positive user feedback and the frequency of the pulses was also slightly slower (e.g., a pulse every 30 seconds for this unit whereas the Sparkpod was every 20 seconds). It is simple to use and can be applied in or around gardens with little trouble. Some people experience good results when putting the oil in a spray bottle for use around the yard. Nature's Mace is environmentally friendly and won't hurt plants or animals since castor oil itself is not poisonous. I recommend this product to individuals who want a safe way to eliminate pesky moles. Moles are tricky creatures and people will have different needs when it comes to choosing a repellent. If you opt for vibrating stakes and don't see any noticeable results, than it might be worth it to try a granule formulation. Want more information about mole products? Check out the below guides where we break down everything you need to know.